1980 - Stuntman in "The Big Brawl" starring Jackie Chan, directed by Robert Clouse. 1981 - 1982 Choreographed and danced the ballet "Lighter"
1990 - Created The Maasai Princess from Motown Records to Stevie Wonder. 1990 - Created "The Top Selling Artist of the Decade Award" bronze statue for Michael Jackson from CBS/Epic Records. 1991 - Choreographed and co-starred in "China O'Brien I & II" directed by Robert Clouse. 1994 - Created "The Celia Cruz Gold Standard Medal"
1996 - Redesigned "The Los Angeles Urban League's Whitney M. Young Award"
1997 -The Nijart Mint releases The Mother of Humanity™ Commemorative Gold and Silver coins. 1998 - Big Ticket Productions "Moesha" television licensed to display The Mother of Humanity™ figurine Maasai Princess print. 1999 - Interviewed for National Park Service (NPS) "Black Liberty Project". 2000 - Created the Jackie Chan Bronze figurine. 2003 - Bodyguard for Michael Jackson on his 45th birthday celebration. 2005 - Designed and sculpted the "Keepers of the Flame" awards. Whitney M. Young, Jr. Award. 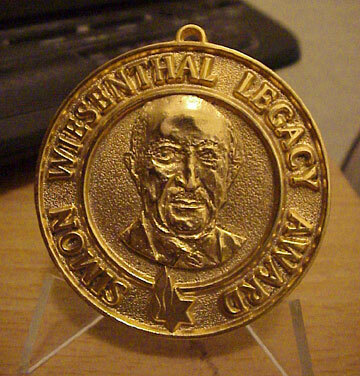 The Simon Wiesenthal Legacy Award. Nijel, creator of The Mother of Humanity™ is best described as a 21st century Renaissance man. He speaks Cantonese and Russian. He is a sculptor, entrepreneur, stuntman, motion picture fight coordinator/choreographer, and author. He is also a martial arts expert who writes for magazines, is the author of several books on the subject, and appears in the A&E documentary "The Martial Arts". Born in Battersea, England, Nijel and his family moved to the United States in the mid 1960's and settled in New Jersey. He attended Catholic elementary school, and the prestigious Seton Hall, and St. Benedict's Prep Schools in New Jersey. In 1968 Nijel began training in the martial arts. In 1980 Nijel received an honorable discharge from the Air Force and moved to Los Angeles. His long time friendship with director Robert Clouse (below) led to the start of his acting career after appearing as a stuntman in Jackie Chan's "The Big Brawl". Following that, Nijel appeared in "Force-Five" starring Joe Lewis. In 1983 Nijel co-wrote Championship Kenpo with Donnie Williams and Steve Sanders. Published by Ohara Publications in California, it was the first martial arts book written by African-Americans and became a best seller. Nijel has worked with veteran martial arts choreographer and coordinator Pat Johnson as the Assistant Fight Coordinator in "Karate Kid II", and later became the Fight Coordinator and co-star in "China O'Brien I and II", directed by Robert Clouse in 1989. Producer Nijel at work with Director Robert Clouse in 1986. Nijel returned to the screen in 1999 as an actor/ stuntman in the film "Imposter" starring Gary Sinise, and Mekhi Phifer. That same year, he edited The BKF (Black Karate Federation) Magazine, featuring Kenpo Grandmasters Steve Muhammad and Donnie Williams, published by CFW Enterprises in Burbank, CA. In 1984 Nijel formed Nijart Int'l, a sculpting and fine art firm. 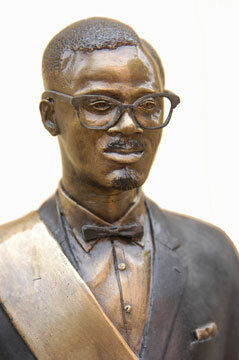 Under the Nijart banner, Nijel has created many fine works of art such as the Bruce Lee portrait bust, and portrait busts of Mohandas K. Gandhi, Dr. Martin Luther King, Jr., Muhammad Ali, and many others. In 1990 Nijel created a bronze sculpture of Michael Jackson for Top Selling Artist of the Decade Award from CBS/Epic Records. That same year he also began his Maasai Princess series, creating one 18k gold plated statue every seven years. The first Maasai Princess in 1990 was purchased by Motown for Stevie Wonder's birthday. It appears in Stevie's video "Keep Our Love Alive". Nijart International's first public monument is the towering 16 foot, 2 ton bronze sculpture, The Mother of HumanityTM monument by Nijel. It was unveiled on Saturday, May 11, 1996 at the Watts Labor Community Action Committee in Watts, CA. Nijel's other artistic achievements include The Celia Cruz Gold Standard Medal, a wax figure of Col. Ron McNair for the Great Black's in Wax Museum in Baltimore, Maryland, and a redesign of the " Whitney M. Young, Jr. Award"
for the Los Angeles Urban League. In 2001 Nijel designed and sculpted The Michael Jackson 30th Anniversary Award which was presented to Michael Jackson on July 6, 2002 on behalf of his fans worldwide. This is the first award to come directly from hundreds of Michae Jackson fans from 32 countries around the world. It is a first class salute to the King of Pop on his 30th year in the music business as a solo artist. The Shirley Temple Day Care Center. on Wednesday, Sept 11th, 2002. Copyright © 2007 Nijart International. All rights reserved.